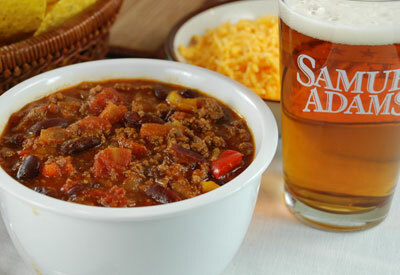 A hot bowl of chili will both warm and satisfy a large crowd of hungry football fans. Top with chopped shredded cheddar, sour cream and scallions, if desired. In a large, deep pot, brown the meat over medium heat, stirring, until no pink remains. Lift from the pot with a slotted spoon and set aside. Discard the fat in the pot. Add the oil and when hot, add the peppers, onion, chili powder, paprika, cayenne, cumin, coriander, and thyme. Cook, stirring, for 4 to 5 minutes or until the spices are fragrant and the onions and peppers begin to soften. Add the lager, tomatoes and their juices, and tomato paste and bring to a simmer. Return the meat to the pot and add the kidney beans and chili sauce. Stir in the hot pepper sauce and season to taste with salt. Let the chili simmer for 45 minutes to 1 hour until thoroughly cooked and the flavors come together. Stir several times during cooking and adjust the heat to maintain the simmer. Serve the chili in bowls, with shredded cheese, sour cream, and scallions for garnish.